A Stone Mountain man was recently arrested for attempting to abandon his dog along the side of the road. The incident took place on Dec. 30, at about 11:30pm on Breckinridge Blvd. in unincorporated Duluth. Gwinnett County Police Officers observed a vehicle pull off quickly and noticed a small dog running after it. Police say as the dog was running behind the vehicle trying to keep up, the officers pulled over the vehicle. The driver stepped out and had the dog’s collar in his hand. The dog caught up and sat down near the driver as he was talking with the officers. The man told police that he was in the process of moving out of his apartment. The complex was going to charge him a pet deposit. 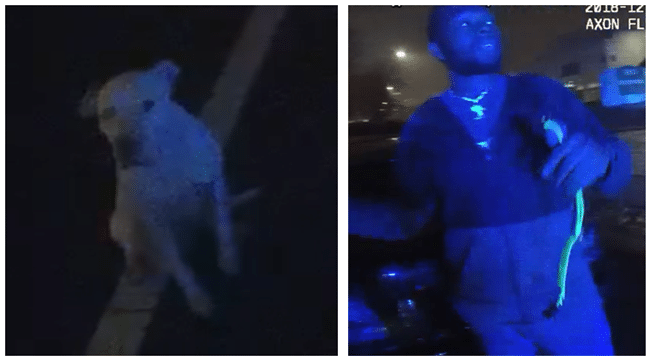 The man was arrested for abandonment of a dog, reckless conduct, no headlights, tag required, and violation of the Georgia leash law. He was taken to the Gwinnett County Jail. The small white dog named Prince was taken by Gwinnett County Animal Welfare and Enforcement and placed at the shelter. Police learned on Jan. 3 that he has an “adoption hold” on him. Once the mandatory waiting period expires, the new owner can pick him up. For more information about how to lawfully surrender a pet, you can visit the Gwinnett County Owner Surrender website.